Disney’s Caribbean Beach Resort, the first moderate level resort for Walt Disney World, has been a fan favorite ever since it opened in 1988. Being the largest resort on property, it has so much to look at and enjoy that park guests could spend an entire afternoon taking it all in. Here are nine things we absolutely love about Caribbean Beach Resort. The Caribbean Beach Resort brings the tropical islands to you with each village representing a different part of the Caribbean. Guests can stay in Trinidad, Martinique, Barbados, Aruba or Jamaica with brightly colored buildings, tropical greenery, and sandy beaches all around. Preferred rooms are located in Martinique and Trinidad North with easy access to the dining hall. Between the music and the atmosphere, along with the sunny Florida weather, it’s easy to believe you really are in the Caribbean. Since the resort is so large, CBR provides an inter-resort bus that makes a loop around the different areas with stops at the Custom House for check-in/check-out and the Old Port Royale dining hall. This cuts down on the amount of walking guests will have to do, especially for those staying in the rooms the furthest from the dining areas. With the resort surrounding a lake, there are plenty of water and sand activities to enjoy such as beach volleyball, boat rentals, and fishing. The 1.4 mile jogging track around the lake is great for runners or guests can rent a bike to take in the scenery all around the resort. CBR also offers an Islands of the Caribbean Pirate Cruise for children ages 4-12. All rooms include either two queen beds or one king bed with a mini-fridge to store your dining leftovers. Of course, what would a Caribbean vacation be without a relaxing nap in a hammock? The resort has several hammocks scattered throughout the resort along the beach, perfect for taking in an afternoon nap after a busy morning in the park. The food court at Caribbean Beach is an experience all on its own. Besides the tasty dishes offered, the décor of the food court makes it feel as though you are in an outdoor marketplace. Each food station is in a different building within the food court and the pale blue ceiling give the illusion of being outside on a sunny day. This resort features its own Table Service restaurant serving a mix of American and Caribbean flavors at Shutters. Open for dinner, reservations are recommended as the delicious menu offers entrees of skirt steak, pork ribs, and plantain-crusted snappers. For dessert, finish off your night with a key lime tart or visit the Banana Cabana outdoors for an evening cocktail by the pool. Caribbean Beach Resort offers one main pool and a few smaller pools, but the main pool is worth the walk over. Complete with a fort, two water slides, water cannons, and two 12-person hot tubs, it’s great for families to play together and get wrapped up in the resort’s theme. Kids can play around on the fort which can sometimes be seen with a pirate flag flying overhead. The zero-entry section of the pool allows guests young and old to gradually make their way into the water, the same way you would a real beach. There’s also a water play area for kids with a pirate ship and slide. Of course, we absolutely love the pirate-themed rooms at CBR. Sleep in your very own pirate ship and enjoy all the Disney touches that pay tribute to the Pirates of the Caribbean attraction. Wall art includes images of the attraction and an etching of a ship can be seen engraved into the shower wall. The carpet is made to look like wood planks and you’ll find your mini fridge hidden inside a wooden barrel. Besides the pirate rooms, which are limited to one village of the resort, guests can enjoy a more colorful Finding Nemo theme with tributes to the film of the same name. Enjoy the character boarder around the room and tropical colors used from the bedding to the floor. 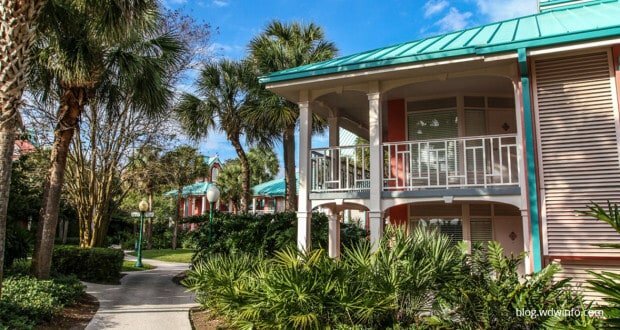 With a resort of this size, and with the amenities provided, it’s a comfort to know that families can stay at the Caribbean Beach Resort at an affordable price. Set at the Moderate level, guests can enjoy amenities like hot tubs and boat rentals that they can’t get at the Value Resorts without paying the hefty Deluxe Resort fee. Two connecting rooms can even be less than the cost of a Deluxe suite during select times of the year which helps keep your family close and your budget low. If you’ve never been to a Moderate Resort before, let your first be the Caribbean Beach Resort. Its relaxing atmosphere and activities for all ages make it an excellent choice for your next Disney vacation. To discover more about Caribbean Beach Resort, consider planning and booking your next Disney trip with an Authorized Disney Vacation Planner you can trust like Mickey Travels. They’ll help you get the best Walt Disney World deal, share expert advice and their services are totally FREE! It’s genius!